Scrapbooking is a great way to display some of your favorite memories. When you begin scrapbooking, the amount of supplies available can be daunting. Here are some of the basic materials you need to start off a scrapbook. Paperwishes.com gives a great listing of basic supplies you need to start scrapbooking. Your first purchase needs to be the scrapbook itself. There are many to choose from, in different themes, colors and sizes. Picking out the book is always the first step, as the paper you use varies based on the size of the book. Some scrapbooks contain sheet protectors already built into the book. These sheet protectors will hold the pages you make for the scrapbook and keep them from being damaged. If the book you choose doesn’t have sheet protectors built in, you will need to buy them. Make sure you are buying the protectors that fit the size book you have picked up. Next, we are on to paper. 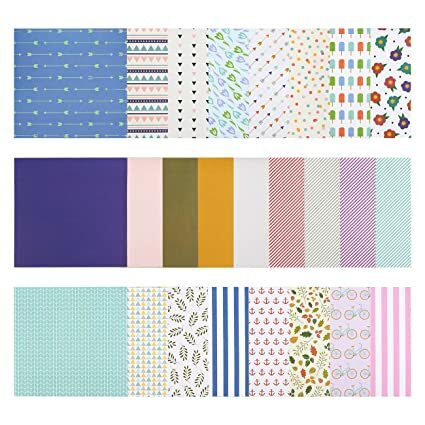 There are a multitude of choices in scrapbook paper. Some paper comes in packs and some is sold by the sheet. Some sheets are plain in color while others have designs or some even have premade scenes, you just add in pictures. Whatever paper you choose, make sure you have enough to be able to fill the amount of pages your book contains. Now that the scrapbook and paper is covered, it is time to think about the other items you need to fill your book. Scissors are a necessity. Whether the scissors are straight cut or have the fancy edges to them that will leave waves and other designs when you cut, you will need scissors. Another must have is adhesive. There are many choices in scrapbook adhesive, but always make sure your choice is photo safe so your photos do not get damaged after time. There is adhesive in bottles, sticks and even tape options. Whatever you feel most comfortable with is what you should start out with. We have covered some great items, but now we need the items that will decorate the pages of your scrapbook. Gel pens are a great basic item to have available. Again, make sure the pens are photo safe when you are picking them out. Embellishments are another key item in your basic scrapbook needs. There are a ton of embellishment options out there. Stickers, decorated tapes, wood pieces, labels and ribbons are just some of the choices. Embellishments will make your page unique and your pictures will stand out. You can pick out embellishments specific to a page or just have generic ones on hand you could use on any page. The other option you have to get basic scrapbook needs is a scrapbook kit. There are pre made kits that contain everything you need to start off scrapbooking. You don’t have much of a choice in what is in the kit, but it is a nice way to get basic supplies if you are unsure of what you need. ← How would you make a scrapbook about/for your kid that loves playing video games?